Mr Mazar also spoke about the incident where a civilan was tied to a jeep and used a human shield by an army major. According to Manzar, when an army chief defends and awards such an officer a message is sent that the government could care less about Kashmiris. It cares not about the Kashmiri people but about Kashmir as a geographical territory. He also spoke about Kashmir being a Muslim majority state but never being Islamic. Today however, one can see voices being raised in support of ISIS, Al Qaeda, dying and killing for Islam. 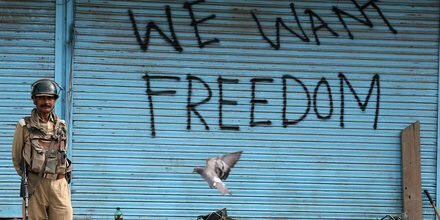 Common Kashmiris have been caught between two narratives: one,of the government which refuses to listen to any authentic narrative on Kashmir but rather continues to believe in a false, constructed narrative on Kashmir. On the other hand the narrative that it is no longer a war for the separation of Kashmir from the Indian mainland but a war to protect the principles of Islam. He also criticized the media for portraying the entire Kashmiri population as terrorists while actually about a hundred boys may have taken up arms. According to Mr. Manzar, this exaggerated narrative suits New Delhi to get the support of the rest of India. He blamed Pakistan for sponsoring terrorism in Kashmir, complicating the situation and called out on New Delhi’s policy making. The stone pelters have often been accused of taking money in return for indulging in stone pelting activities. Mr. Manzar countered this by saying that the Kashmiris were relatively well off and no young man will risk his life for a paltry sum of 500 rupees. There were genuine grievances which led people to take part in protests and demonstrations. While he accepted the fact that top leaders and militants may accept huge sums of money, the common population was out on the streets purely due to anger and frustration. Mr. Manzar also spoke about the role of Pakistan and did not discount the fact that Pakistan plays its part in fomenting unrest in Kashmir but as an ordinary Indian citizen, he could not challenge Pakistan as he and no authority to do so. It was the responsibility of the Indian State to wean the population away from Pakistani influence. He also said that while it was easy to procure guns if one wanted what was important was that there must be an incentive, a root cause to the discontent which forces people to take up arms. One can have access to arms in any state of the country be it Rajasthan or Karnataka but these states are peaceful because the people there have no reason to take up arms and guns. The common civilians value peace above anything else and indulge in violence or protest only when pushed to the brink. Mr. Manzar pointed out how PDP Chief Minister Mehbooba Mufti has been begging for opening communication channels and said that the only way to achieve a solution to the dispute would be to engage with the Hurriyat Conference which would act as a buffer between extremism and peace in Kashmir. The government has consistently refused to deal with the Hurriyat Conference accusing them of being extremists and separatists but the Hurriyat was the only bloc who believes in the use of non violent means to express their discontent and ignoring the Hurriyat would only lead to more disillusioned youth joining the ranks of militants using terror tactics. Mr. Manzar also said that Mr. AB Vajpayee was highly respected by the Kashmiris even today because he was the only Prime Minister who admitted that the Kashmiris had been wronged and had never seen a free and fair election. He undertook a number of confidence building measures and entered into a formal ceasefire agreement with Pakistan in 2003, greatly improving the lives on those living on the borders but the same NDA with a ruthless majority is blocking all communication channels. Prime Minister Modi, while inaugurating a tunnel in Kashmir, asked people to make a choice between tourism and terrorism, however, we have to understand that terrorism is not a choice; it is a reaction to the alienation that the Kashmiris have been suffering since decades. Tourism and terrorism cannot be alternatives to each other. This was followed by an interactive question and answer session wherein the members of the audience brought in their perspectives and concerns into the discussion. The questions touched on the issues of integrating the Kashmiri Pundits, human rights violations by the Army, Article 370, the role of various stakeholders such as the central and state governments, Pakistan, separatists, militants etc. On the question of the Pandits, Mr. Manzar wholeheartedly agreed that they had been wronged and that he felt the pain of the Pandits. However, he pointed out that as an ordinary Kashmiri, he was helpless in the face of threats by the militants on the one hand and lack of protection by the government on the other. He also felt that Mr Jagmohan alone could not be held responsible for the situation and the New Delhi should have taken more responsibility. The law and order situation was fragile and there were threats to the life and person of the Pandits but the then governor Jagmahon’s solution of transporting the Pandits out of Kashmir by busloads was not the correct approach. They should have instead been protected where their homes were and the State should take the responsibility of ensuring their return to the Valley.